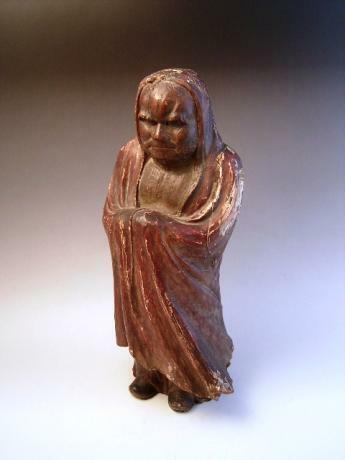 Japanese 19th century carved and painted Dharma, or DARUMA. The entire piece is beautifully carved, however the robe, shoes and bottom of the piece were cover in GOFUN (paint made from ground oyster shells)and painted over in colored pigments. 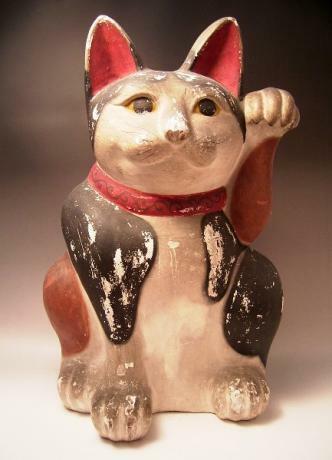 The face and chest are just carved wood and the eyes..
Japanese circa 1900 large FUSHIMI cat. Fushimi is an area of southern Kyoto in the vicinity of the FUSHIMI INARI TAISHA SHRINE, where clay from this area has been used to make figurines for centuries. This is particularly large FUSHIMI cat. 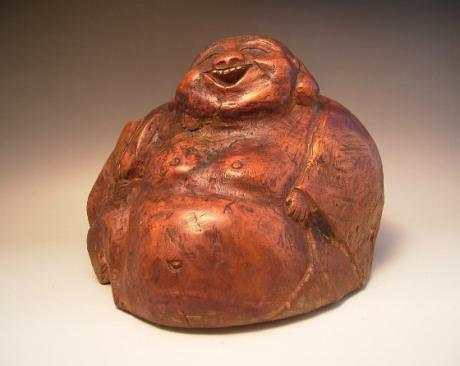 The cat has the characters HINAYA, for the maker, car..
Japanese mid 20th century carved wooden HOTEI figure. The figure is wonderfully carved with great facial expression. His is fan sits against his right shoulder. The figure measures 9" tall, 11" wide and 10" deep. Unsigned. 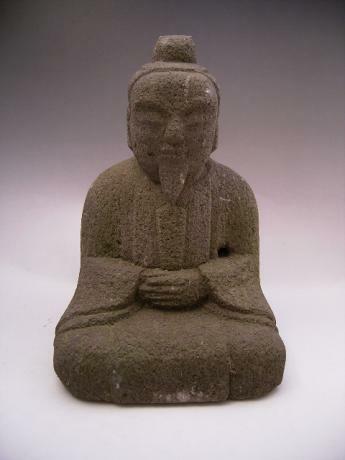 Japanese circa 1900 stone statue. The statue is of TENJIN, the god of education. The statue measures 7 1/2" wide, 11 1/4" tall by 6 1/2" deep. 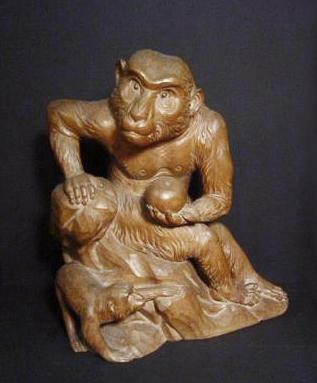 Japanese mid 20th century Hokkaido carved large wooden Ainu bear. 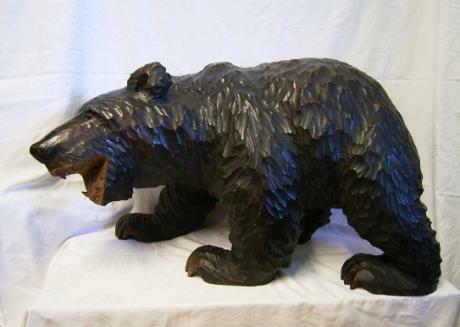 Signed and dated by artist on bear's feet. The bear has the date June 10, 1961 carved into one of the feet. Apparently the bear was presented to a teacher. 36" long by 19" tall by 15" depth.